Karate classes in Fairport, NY. Our traditional karate program has everything that you would expect from a martial arts program and more. We pride ourselves on having the best classes anywhere. Our traditional karate program involves both sport and traditional martial arts, with effective self defense and an intense fitness program as well as jujutsu & kobudo! We have classes for all ages, with classes starting now. 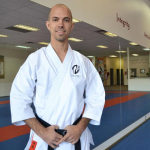 Interested in Brazilian Jiu Jitsu classes in Fairport, NY? Our Jiu Jitsu program concentrates on your ability to use leverage and superior body positioning to control your opponent on the ground regardless of size and/or strength. This allows the smaller or weaker person to defend themselves against a much larger attacker! Most confrontations end on the ground, it is extremely important for you to be able to defend yourself from that position! Click to get a FREE CLASS! We teach an incredible traditional karate and jujutsu programs focusing on self defense and improvement of mind, body & spirit. We have had great success teaching to all levels of fitness and ability. At Kime Karate, our martial arts programs offer an incredibly well rounded training experience for incredible self defense & amazing fitness! Earn black belts in three uniquely different martial arts styles, each with their own separate class! Train the skills you want & need! FITNESS – Our classes are intense! Burn calories, loose weight, tighten and tone! Come prepared for a great workout and a great time! SELF-DEFENSE – Train to protect yourself using practical self defense techniques against a variety of situations. Defend yourself against multiple attackers, weapons, standing or on the ground. Prepare yourself now to defend yourself when you have to! STRIKING – Our Karate program will develop your striking skills, giving you amazing quickness and power whether you’re using your hands to strike with or your legs to kick. One good hit is all it takes to change a fight to your favor, give yourself the skills you need! GRAPPLING – Our karate program is incredibly well rounded, teaching superior ground positioning and body dynamics for a solid ground defense. Our Jujutsu class takes this to a whole new level! Control your opponent and dominate on the ground! NO EXPERIENCE NECESSARY! Our instructors are trained professionals that are here to help you. We remember what it was like to be a beginner. We are here to encourage students to grow and guide students towards self improvement. Give us a call and check out a FREE TRIAL CLASS! New students start all the time, why not be one of them? These are practical, functional martial arts based on self defense. Each program is different in their style and approach in creating an efficient self defense system. Pick your preferred style and come try a class! Choose Your Martial Art, Share This Page!